Railpictures.ca - Bill Thomson Photo: Another photo of Canadian Pacific “Big Hook” 414501 (an Industrial Brownhoist 250 ton wrecking crane, at time of this photo still steam powered!) working at a wreck at Dixie on the CP’s Galt Subdivision in 1959. It was quite pile up of cars (no locos) mainly from the Kitchener/Waterloo and Galt areas, including beer and whiskey in box cars (from Seagrams & Carlings in Waterloo) and a lot of limestone from covered hoppers. What was unusual was the lack of security – just one railway policeman in uniform. When I approached to take photos he came up to me and said be careful, also do not take any booze. Note workers on crane – very casual, no hard hats, etc. A diferent era compared to today. CP 414501 after retirement at Exporail: http://www.railpictures.ca/?attachment_id=23098 | Railpictures.ca – Canadian Railway Photography – photographie ferroviaire Canadienne. 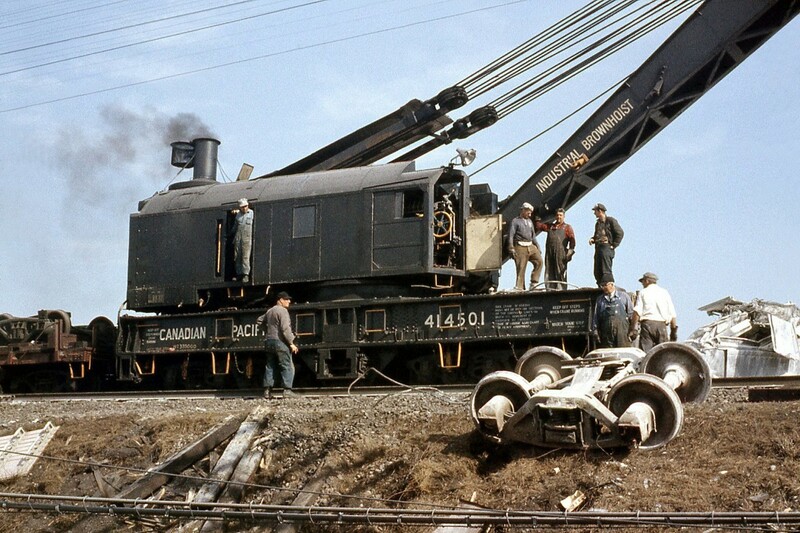 Caption: Another photo of Canadian Pacific "Big Hook" 414501 (an Industrial Brownhoist 250 ton wrecking crane, at time of this photo still steam powered!) working at a wreck at Dixie on the CP's Galt Subdivision in 1959. It was quite pile up of cars (no locos) mainly from the Kitchener/Waterloo and Galt areas, including beer and whiskey in box cars (from Seagrams & Carlings in Waterloo) and a lot of limestone from covered hoppers. What was unusual was the lack of security - just one railway policeman in uniform. When I approached to take photos he came up to me and said be careful, also do not take any booze. Note workers on crane - very casual, no hard hats, etc. A diferent era compared to today. CP 414501 was converted to diesel and went on to work the clean up of the Mississauga wreck in 1979. Bill very nice photo. Captured the moment perfectly. Very interesting picture. Dixie? Is that where today’s Dixie GO station is or further west around Stanfield Road? I will admit I don’t remember any wreck up that way but I would have only been 6 years old when you took this shot. Similar to a photo I submitted quite some time ago, Bill……..a 1977 work gang down East. The guys were in t-shirts, running shoes, shorts; no hard hats anywhere; just milling around like they were having an outdoor gab. I was amazed how casual things were some years ago.